If you are considering a kitchen or bath remodel, let us help you take the first step! Remodeling a kitchen, remodeling your bathroom, or remodeling your office can be a daunting process. Whether it’s choosing the type of cabinets, design, duration or budget, it frequently leaves a customer with a mind-boggling amount of choices. 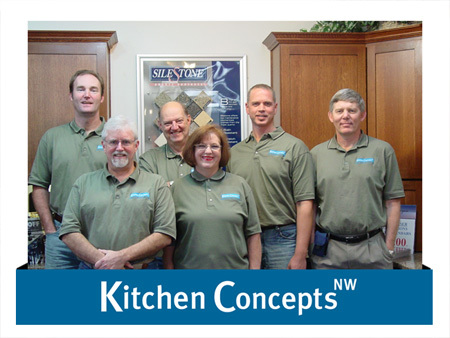 Kitchen Concepts NW, LLC simplifies these hassles with one simple solution: a team of experts genuinely committed to their work and customers’ satisfaction…. “People want service. The advantage of a family owned company is, we are personally involved with every customer. They are not just a number but precious to us! We have stayed in business for 20 years by taking care of our customers” Dave Warren, Owner of Kitchen Concepts says. Paying special attention to each customer’s needs is essential, Warren says. Dave reviews every order to make sure all the “kinks” are worked out before the new bathroom or kitchen cabinets or bathroom or kitchen countertops is ever ordered! “Why would you want to go to a Big Box store when you can go to a specialist like Kitchen Concepts NW, LLC with a combined 45 years of experience? We already know where the common pitfalls are and try not to repeat them twice” Dave says. He has opened two stores, one on Division in Gresham, and one on 122nd and Airport Way in Portland. Along with kitchen cabinetry they also specialize in bath, home office, entertainment centers, closets, as well as countertops. Customer satisfaction is our top priority. When a customer enters, the goal of the staff is to form a personal relationship in order to create a design to meet their highest expectations. We want to ensure the customer has no questions or confusion about their project. We work hard to make certain the customer knows exactly what will be built. Computer Design So You Can See Your Remodeled Kitchen or Remodeled Bathroom Before You Buy! Dave is so dedicated to this commitment that he has invested $6,000 for a computer program that allows customers to view virtual images of potential floor plans. This helps the customer get a better idea of what the project is going to look like and gives them peace of mind. You would think this type of personalized service would cost a fortune. NOT TRUE! At Kitchen Concepts there is a wide variety of quality materials available to meet any budget. Not only are the prices competitive with the “big box” home improvement stores and the service much better, but the greatest advantage Kitchen Concepts has is their high quality craftsmanship not found in “mass produced” cabinetry and the designs you will get from our professional designers. Take a look at some of the beautiful remodeled kitchens by Kitchen Concepts NW LLC, in our online gallery! For customer Judy Giorgi, her experience with the Kitchen Concepts team literally eased the stress of remodeling in two previous homes. She remembers going back and forth between ideas and changing her plans numerous times but the relentless staff were patient and flexible. “They just bend over backwards to get it done,” Giorgi said. Check out some of the other customer testimonials for Kitchen Concepts here! Kitchen Concepts NW is located both in Gresham and in Portland Oregon. Please select here for hours, contact information and directions!